Continuing with my Elections Results Maps, here is the 2nd Congressional District race. 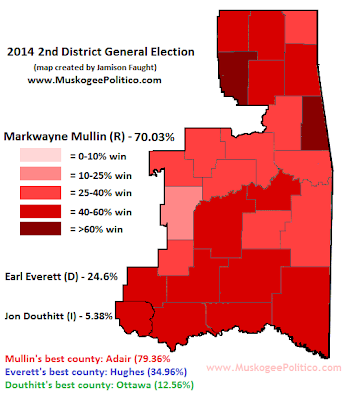 Mullin's "worst" showing was in Hughes County, where he got 59.51% to deceased Democrat Earl Everett's 34.96% (his best showing). There were four counties where less than 20% of the vote went to the Democrat (Adair, Delaware, Nowata and Rogers), with Everett receiving just 15.57% in Rogers County. If a special election is called, things look pretty dire for State Sen. Jerry Ellis, the Democrats' substitution pick. Mullin got about 72% of the vote in the area comprising his state senate district.